At First Parish, we support individuals to live out their faith in ways that foster our mission: To nurture the spirit; grow in community; help heal the world. We have a Faith in Action committee which creates opportunities for our congregation and the greater community to engage in this work. The Racial Justice Team educates and promotes racial justice by providing people with the tools to be change agents for racial and social justice. YFO is First Parish’s oldest faith in action endeavor. Though YFO has been independent of First Parish for over 30 years now, the ties between us are still strong and healthy. Members of First Parish have served on the YFO Board of Trustees since its inception, and continue to be active volunteers and stewards to this day. The First Parish Bylaws call for the “official” endorsement of YFO Board members at our Annual Meeting each spring. YFO has a rich and unwavering history of serving some of Portland’s most disadvantaged children and families. 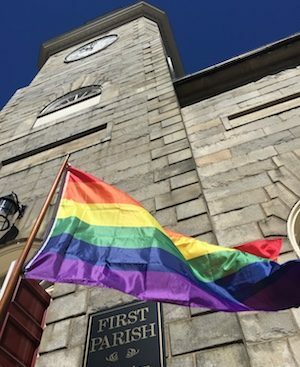 Founded in 1844 as a community outreach mission of the Unitarian congregations of Portland, from the very start its mission has been to serve those who are under-resourced. Throughout its long history, YFO has provided many different kinds of support to this important part of Portland’s population. Since 1986, YFO has run an early childhood care and education program for children ages 6 weeks to 5 years. In line with its mission, 60-70% of the approximately 60 families YFO serves are low-income families. The first Sunday of each month, First Parish volunteers prepare and serve a free dinner to our community. Volunteers are always needed to prepare the meal (2-4:30) as well as to serve and clean-up after the meal (4:30-7). We serve dinner at 5pm to about 40 people each month. Historically, we received support from the Wayside Food Program. Starting in 2016, we’ve continued to provide Community Dinners thanks to generous contributions from local businesses. Trader Joe’s donates flowers, Standard Baking Company supplies bread and pastries, the Portland Food Co-Op has donated $150 per month for food supplies, and we’ve received donations from Maine companies. In addition, a portion of the First Parish annual budget is dedicated to Community Dinners and the Women’s Alliance of First Parish wants to support the dinner by supplying baked goods. First Parish teams with Allen Avenue UU once each month to staff an evening meal at Preble Street Soup Kitchen. The soup kitchen serves over one million meals a year to Portland’s neediest inhabitants. Recruiting for volunteers has been ongoing through the church year, but the group has not expanded beyond its initial size of three. Allen Avenue supplies many more volunteers, so the evening is generally well staffed, but there is always a need for volunteers to cover for vacations and illness. The Black Lives Matter subcommittee was founded because we can no longer remain silent to the systematic devaluation and state sanctioned violence against black women, men, and children in the US. 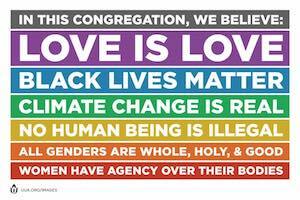 We have put up a banner as public witness and as a display of solidarity to the people of color led movement; to declare to all who pass by our building that we believe in the inherent worth and dignity of every human being. To further engage the community, we facilitate discussions around race and white privilege at First Parish. We have held a white privilege discussion group, a book discussion group, and hosted an NAACP youth group performance and community discussion panel. Plans include another book discussion group and a free movie screening and discussion. We are planning anti-racism workshops and other events as well. Continuing in the Unitarian Universalist (UU) tradition of social activism, MUUSAN gives voice to our UU values in the public arena. We seek to amplify individual and congregational efforts by joining together at the state level to influence policy development and to promote a more just society. MUUSAN meets at 10a.m. 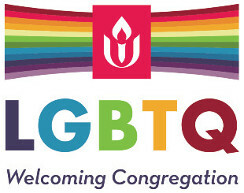 on the 2nd Saturday of every other month (January, March, May, July, September and November) at the UU Community Church of Augusta. The main goals of the Climate Action Community are to promote climate-related activism among First Parish members, facilitate energy efficiency, and work with local and state climate-related organizations. Here are some examples of activities and accomplishments during the 2016-2017 church year: Eighty First Parish members (the largest number of signatures of any organization in the state) signed the “Children’s petition” calling for climate action, for submission to Maine agencies. Thirty four people attended a workshop on climate action by the Reverend Fred Small of Massachusetts. Twenty four postcards supporting solar power legislation were sent to state legislators. CAC members advocated for a statewide energy policy and the Portland community solar farm, started Rally4Justice in response to the recent national election, lobbied in Augusta for climate action and solar power, participated with groups such as the Citizens Climate Lobby and the Sierra Club, and gave a sermon on the urgency of protecting future generations by addressing climate disruption. The Center for Restorative Justice is an all-volunteer initiative started by First Parish in 2011. Our primary mission is to support youth in the Greater Portland area who are at risk of getting enmeshed in the criminal justice system. We facilitate restorative conversations in which the victim of a harm can meet with a youthful offender, ask questions, explain the impact of the youth’s action, and begin to heal. Restorative conversations provide a youth with insights which our retributive system cannot. The results are a more cohesive community. The Center also provides Healing or Listening Circles for cases involving several perspectives, for youth and for groups within our First Parish community. 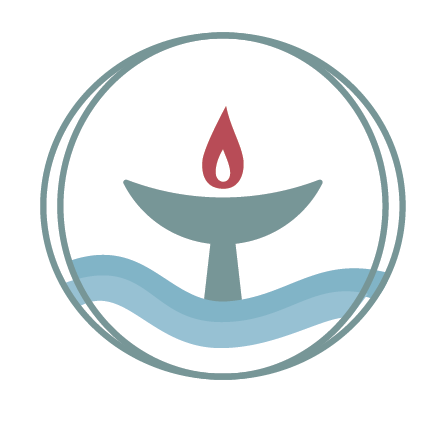 We provide all the training for our facilitators and Circle keepers, to individuals within the First Parish community, and to Unitarian church communities across Maine. To date, we have worked with 24 youth, ranging in age from 10 to 18, in facilitated dialogue and in Circles. Some cases take months to resolve and some take a few weeks. Some came to us through schools, some through the Department of Corrections. 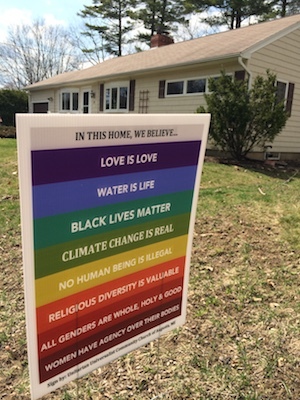 First Parish members continue efforts to reach out to Portland immigrants. Our work includes running the Friends of Safe Harbor Cooking Class where we strive to make meaningful connections with new immigrants (first Wednesday each month from 5-7 pm in the Community Room), regular participation in monthly Welcoming Immigrants Network meetings, and occasional events in the Parish Hall. This is currently a temporary committee set up to prepare for a day-long workshop that will be facilitated by REACH, the Maine Wabanaki community outreach organization. The workshop will educate attendees and prepare them for advocacy work with Native Americans. From time to time, First Parish organizes public forums to bring together speakers from city, state, and local organizations to address pressing issues of the day. Public forums are an opportunity to gain a deeper understanding of a particular issue, ask questions, and come together as a community. 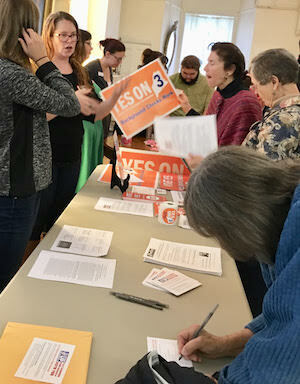 Past forums topics include immigration, living wage, education, LGBT, Earth Day, Labor Day, Portland’s future, the election, and a Portland mayoral debate. 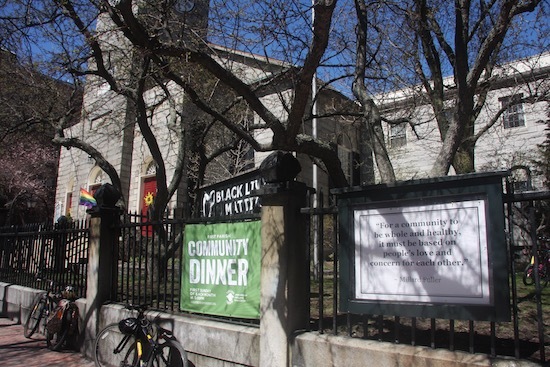 Formed after the 2016 elections, Rally4Justice (R4J) mobilizes events at First Parish to work for social justice and oppose hate, racism, sexism, economic inequality and government by and for the wealthy few and big corporations. 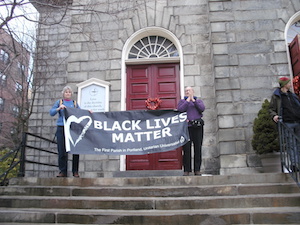 Our first forum on January 21, 2017 brought almost 200 people into our historic Meeting House to hear from three Maine Legislators and speakers on Immigrant Rights, Healthcare as a Human Right, Environmental Protection, Economic Inequality and Civil Liberties. The second R4J gathering in February 2017 focused in on racism and healthcare followed by small group discussions. Volunteers stepped up to help with email list, social media and event planning at the R4J Organizational Dinner in March. We worked with March On to organize joint Tax Day events on April 15, 2017, participating in a rally in front of Portland City Hall calling for President Trump to release his tax returns – followed by post-card signing, refreshments and networking in the Parish Hall. This Stamp Out Tax Injustice after-event generated over 200 handwritten communications mailed to elected officials in Washington and Augusta, calling for fair taxation and federal and state budget reform. For more information, contact fia@firstparishportland.org, check us out at rally4justice.com, or follow Rally4Justice on Facebook and Twitter.